What I always found fascinating was inertia in economies. If a society has a dominant industrial sector, it can't switch to "knowledge society" overnight. It was puzzling to me, that focus in GalCiv II could be switched so quickly - it's like everybody goes to work in a factory today and tomorrow they work in a research center. It should IMHO be a smother transition and take some time, depending on the magnitude of the change. The "research-wheel" with its granular, hexagonal structure (similar to the galaxy map) might contain a simple solution. What, if a setting can only "move" 3 tiles per turn (just like ships move on the galaxy map)? The indicators would be persistent, and updated each turn until the "destination" is reached, just like with ship movement indicators. In this way it is intuitively recognizable what is going on. Maybe technology could later on accelerate the industrial/economic adaptation rates (4 instead of 3 tiles change). Certain races like the Yor (installing a new program or subroutine is quicker than learning for humans) could have a bonus from the start. Even different game paces could be accounted for (playing a fast game - more tiles allowed, playing on marathon - only one tile change per turn). I think this mechanism is easy to implement, transparent to the player and realistic. And it requires the player to plan ahead a little, adding a strategic element, without altering gameplay in any major way. What do you guys think? Is economic momentum something you would like to have in Galactic Civilization III? I like it actually, possibly makes more sense. However I always understood it as more of a budget than perhaps workers. Each turn is a week I believe? And in that time you say pull out 20bc credits from production and start funding it into your technology sector. I like it. It would force players to put thought into balancing the economy. And make puting anything to 100% much more costly and risky, since you can't just make a complete flip in economic focus in one turn. Yeah! I support hard choices and opportunity costs. That's pretty clever. I like it. I absolutely like this idea! Hate it. That would really slow down the game pace. And all it represents is the funding for the government facility or whatever you want imagine. If there was a lab that has 100 worker to run the facility. And you increase funding. All it does is raise the efficiency. And technically, its one a weak wait. Which is more of a warning than we got when the recession came. if a can modd it out. I won't care, but I hope I won't have to. In response to some questions I want to elaborate the reasoning behind the mechanic and then I have a question to DARCA1213. Renney77, you are right, its about funding, not workers—but what does that money buy? It allows the allocation of larger amounts of the best materials for the projects you are funding, with the money you can re-purpose facilities and hire the smartest people. In short, you determine what is being done with the stuff you have (i.e. resources, including labor). That is why I see money more like a place holder for other stuff, like workforce—I apologize for not making that clear. thetraviler, since I do not know for sure, how industry/science is calculated in GC3 and how buildings come into play, I can only guess from the things that have been revealed: buildings provide a percentage bonus (like +10% Industry), and population is said to play a bigger role, maybe output = population number*percentage spending (0-100%)*(100% + building bonuses + race and other bonuses). So yes—both kinds of buildings are there the whole time, its just the question to what extend you use them. Think like: they run only on 50% of maximum conceivable capacity, if spending is at 50% for that sector. Now, if you change that focus, you need to start newer and larger projects in the favored branch, need to train more people, in other words fill those factories with buzzing and productive workers doing the right things. That takes some time. DARCA1213, can you help me to understand what you mean by „really slow down the game pace“? It would take like 4 to 5 turns to go from one extreme to the other (like 100% research to 100% production), considering it is a gradual shift, you effectively „loose“ only half the time, i.e. 2-3 turns. For that to „really slow down“ your game, I imagine you switch very frequently between extremes (Money/Output; Science/Production)? If that’s the case, it sounds like you use the sliders for micromanagement—to shave off a couple of days here and there. I personally understand the sliders more as a longer-term instrument for macromanagement: how do I want my empire to develop. I would only switch it a couple of times during the game like between peace and times of war or to balance my spending. But then again, that is just my opinion and you probably have much more experience. And of course, you have adapted your strategies to the present game mechanics. Maybe you are right—it is a game and need not be very realistic. I don't know about where you work, but where I work most of the tasks are specialized. The systems, jobs, management structure, and even which offices have working computers in them are geared towards the budget and staffing we have now, with room for minor changes. If you suddenly tripled the budget tomorrow, the output would not triple tomorrow. We'd need to hire people, get equipment for them, train them, and with an influx that large fix the management structure so it works with a much larger staff. Actually in our case, we'd need a new building to put them in. But lets assume that isn't a problem. If anything the delay should be a lot longer, but I think this proposal still works within the game while not letting you flip your economy overnight. I really would like to see this in the final game! ...As long as the wheel indicates both current and target production in the same way that a ship simultaneously has a target location and a current location. To expand on a suggestion above: it initially could start moving one hex per week, and certain techs could increase your "Production Mobility", or something like that. GalCiv plays in a hyper-compressed time scale on a lot of different levels. Research on basic science doesn't happen in a week or two. Regardless of your manufacturing capacity, a new building doesn't go up in a week either. Population clearly doesn't grow as fast as it does in the game, either. I think it rather odd that people care about timescale realism on one particular aspect and not others. That's a really cool idea mate, I can tell you've put a lot of thought into it! Personally though I wouldn't want to see it implemented, as it takes the game too far into the deep ends of realism for me and I don't think that I would find it fun, more annoyingly real worldly. Thanks for putting your idea out there though, that takes gut's and it's great that we have such a supportive community that comes up with, and welcomes, new ideas from players! Keep up the good work! In the real world all of this would be correct. Tridus is correct, alfandtot is sorta correct. I don't move them that much apart from the beginning when I am balancing my budget. But seems that waiting equals realism here. And there are better ways than putting more limits, restrictions, and waiting. I just don't see how I should wait 5 game turns for something that was near instant. I wait ALOT in life, patience is my greatest virtue but I don't like this. Take Tridus's example. Now reverse it. Lets say Tridus is a scientists in my Republic Empire and he is working on a tech in my new research facility with robots and whatever equipment there is. Now the tech is complete or there's a war or I want a constructor. funding is cut for the project. I don't think that means Tridus is out of a job or underpaid by my generous government. (like I would hire him. Lol) since I already pay MAINTENANCE! Ahhaa you all forget about that! Tridus is still tinkering away with lazers and hard drives thanks to that expensive game feature. so feel like I would be paying and waiting twice for nothing. Remember, maintenance. ^This pretty much sums my thoughts. That...was beautiful (tears falling from face) fate. Thank you for your for your opinions (and the kind words you put them in), I really appreciate it. As I admitted, more realism does not necessarily equate to more fun in a game. However, in GC2, the possibility to "fine tune" production/research times (adjust sliders, so that things juuuuust got finished) led to tedious micromanagement that was no fun for me. Why, you ask, do that? It was because "left over" production/research was wasted. You actually had to pay for the full production/research in that turn (bc), but after something was completed, the left over points were not carried over but wasted. Hence the inertia proposal: eliminating the POSSIBILITY to micromanage in such a way, would streamline the game experience me thinks. Along with adding the bespoken realism. Think of WW2. At first the Japanese had quite some advantage in the Pacific, because they had maxed out their military production for some time. The US had to scramble everything and was on a back foot for the first couple of years. Things really hang in the balance until the government spending and the switch to war times production was in full swing (factories that used to make refrigerators now made airplanes and the like). I just wanted to paint out my idea and the reasoning behind it to see what you thought of it. As it turns out some like it and some don't. Thanks for the active discussion, I'm enjoying it! Well, your main reason for wanting this is no longer a problem. You do not pay for production that isn't used any more. Also, we're going to have much more control (possibly even FULL control) of individual planetary spending independent of the main civ-wide settings. I played with the sliders very little, at the very beginning of each game. Once I got more than 2-3 colonies the sliders were set in stone until I was close to finishing the tech tree. 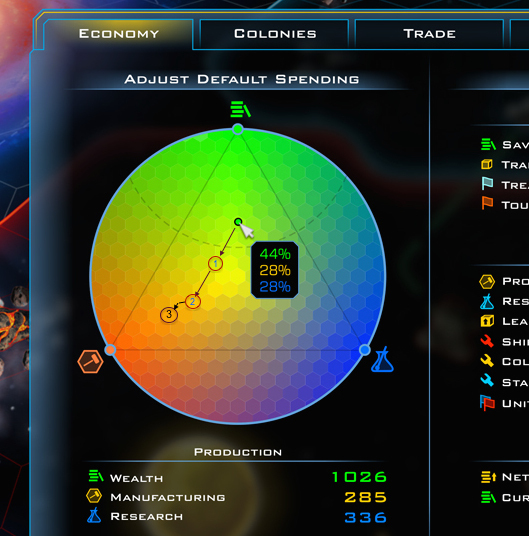 Then one major switch to social production until my planets finished building, then a switch to 100% military spending. Adjusting turn by turn is highly inefficient, both in terms of time and of spending. It was far better to get planetary production to come out pretty much even across planets, then design ships that used that production nearly evenly (i.e. lots of planets at 48-50 or 95-100 cranking out a tiny-hull constructor every turn or every other turn). Once your economy was up, the best way to deal with buildings was to go through your planet list and buy out anything with only one turn left. That way every planet was spending its full production building something rather than wasting money using a fraction of its total output. And since the last bit of a building is the cheapest to build, it reduced the cost of buying things significantly. The drengin could sell flowers and I wouldn't care if I could modd it out. you seen like your going to be a good forum buddy. So welcome and stay for the text few years! I think you'll love the new sliders when you finally playing with them. If you want something don't someone else tell you no without a valid reason or a fight. You actually had to pay for the full production/research in that turn (bc), but after something was completed, the left over points were not carried over but wasted. In GalCiv 2 That is definitely not true for Research, the excess research points get carried to the next tech. For production I am not sure but I believe the excess is returned to you as BC. Would need to run tests to confirm. No problem mate, I hate threads where people are uncivilised! I played with the sliders very little, at the very beginning of each game. Once I got more than 2-3 colonies the sliders were set in stone until I was close to finishing the tech tree. Did you ever try the 100% forever play? At the beginning of the game set 100% Research in your spending, only build Research Labs as your production buildings (you have to buy the first few on a planet) then focus production on each planet depending on whether you want to build ships or buildings. It's extremely effective when your neutral and get the absolutely bonkers research buildings! There's no wasted maintenance on buildings being under utilised and you always have a tech lead on the other civs, so the few ships that you do put out are of a far better quality, and you can just buy more from your mountains of cash. Excess research points get fully carried over, if there is a tech next in line. If the researched tech is the last in line, then part of the excess points may get carried over to the next tech. Sole Soul explained here how it works (as far as he knows at least). Excess social production only gets returned in BC, if there are no more buildings to construct (i.e., the finished building is the last in line). Otherwise, it is wasted. Excess military production is always wasted. I don't think that means Tridus is out of a job or underpaid by my generous government. (like I would hire him. Lol) since I already pay MAINTENANCE! Ahhaa you all forget about that! Tridus is still tinkering away with lazers and hard drives thanks to that expensive game feature. No, you're paying the maintenance cost in order to keep the building in top condition. It doesn't mean, that you are still funding any research/production. Sort of kin of maybe who can say for sure Gaunathor. I started off saying "I don't think" because it's a vague subject open to interpretation. Yet, you seem very sure Tridus is unemployed. But your right, I am paying six billion credits a week on a empty building and there is no way employees are covered in that. So I could never use the focus button to raise output because nobody is working on a government project and civilian projects don't count because they don't make weapons. Lol. Are you implying people *didn't* do this? Although mine was usually all factories, not all research. For the entire Dark Avatar expansion, all one or the other was the only way to play at high level. That's why the focus mechanic was changed for Twilight. Besides, I don't think you're understanding the magnitude of my typical research output. I'm usually finishing the tech tree not long after the colony rush is done, although I do artificially slow down the colony rush by kneecapping the AIs pretty harshly early on. And that's without keeping research planets for myself: I build them and sell them to whichever AI I gave my econ treaty to, so I can get whatever techs they research. Once one AI starts researching tech victory, I kill them off and give the econ and research planets to the next AI on the hit list. Idea is interesting, but in reality you usually don't stop your factories and reassign all of the workers into "social" (we still talk using dual queue terms) projects' building, and research. Nor you assign "all hands" on a single task, because there is upper threshold or throughput, limiting their productivity. Delay in shifting focus indeed seems like nice idea (as long as it optional for those unwilling to use it), but I agree with DARCA, we already pay maintenance for structures we built, so it's safe to assume we pay for something more than just roach patrol and some guy with bucket of paint, who renew the old walls. I think we need to have minimal throughput/threshold implemented into "focus" system, where no matter how little money we invest in, those branches should still work. Not with "skeleton crew", but with full staff packed in, while adding finances would allow certain boost, yet again, with upped threshold/throughput, to prevent us wasting resources. Say Earth has 48 industry cap, and 72 research cap. That's minimal values you'll get no matter what. Changing focus on research could increase research cap to, say, 144 (I simply doubled it, yes), but no matter how much money you'd invest above that, there will be no boost beyond this value, simply because industrial or research capacities are unable to provide more room. This way there will be no point going into "0 on military, 30 into social, 70 into research" anymore. Unless, if course, when we pick zero, we stop paying maintenance costs in selected area for all related objects. But I doubt anyone would need that, unless real emergency, like huge population loss, where you need to regroup your people into different objects. But giving the amount of automatized manufacturing, I'm not sure we need 37 billions lathe operators. adding a strategic element, without altering gameplay in any major way. Brad would know better but I would expect it would have a big impact on AI players. One of their biggest strengths is that they can optimize spending everywhere every turn.